· KNIT PRO is the application specially designed for Knitted Fabric Manufacturer. You can manage your each roll of the fabrics by roll barcode from the knitting machine, Dying, Finishing, and Store until sending to customer. 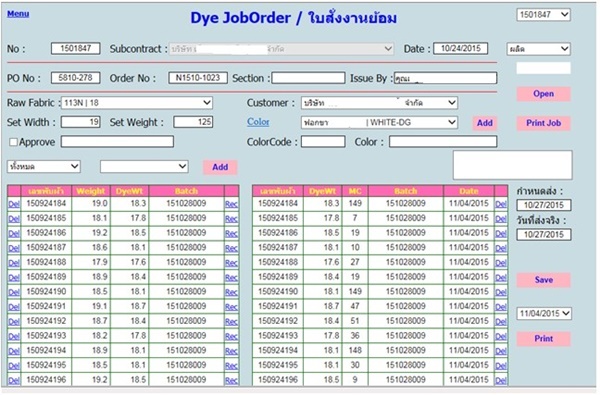 · KNIT PRO has many features that help managing the knitting fabric manufacturer control the finished goods, including Knitted Job Order, Dyeing Job management, Finishing Job Management, Other Job Management, Stock Receiving and Packing List. KNIT PRO applies the Barcode System for controlled the finished goods in each fabric roll level. It enables you track your product in every processes efficiently and easily. · KNIT PRO provides many reports that you can use immediately by the system such as Work in Process (WIP) reports, stock balance reports, Production Reports, Pending dyeing job reports, Pending Production Job reports, etc. · KNIT PRO is Web-Based application. So you can work with KNIT PRO anywhere and anytime you need. You don’t need to worry about the flood, traffic jam, road closed or any unexpected circumstance that cause you cannot work at your office anymore. · You can save much money for investment and expense because it‘s monthly fee application. The monthly fee is for application usage fee and support fee. You can save much money for investment and you can confident for the application support and development that we service you consistency and continually. 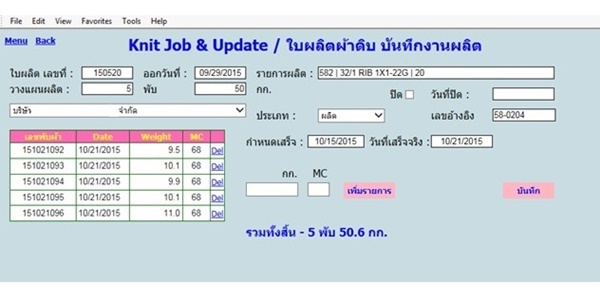 · Planned knitted job order and planned finished date can be recorded in the system and compared with the knitted output. The system also provide the reports of the pending knitted order and pending quantity of knitted fabrics that have not yet produced. So you can manage your production more efficient. · You can manage you dying job from sending each roll of knitted fabric to the dyeing and receiving it from the dyeing factory. The dyeing order, including the weight of each roll can be printed out from the system for sending to the dying factory. · The barcode sticker of each roll of fabric will be generated by the system when receiving the fabric from the dying factory. 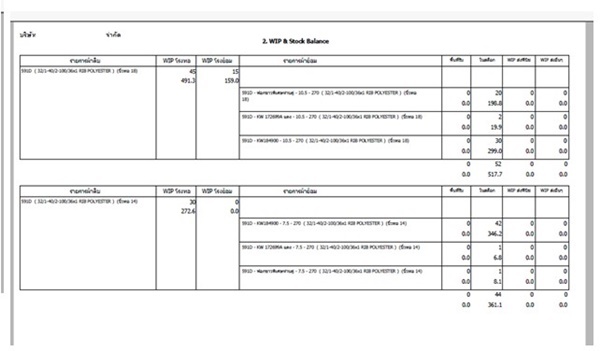 · The system provides WIP reports and pending dyeing fabric reports. That enables you know the status of each roll of fabrics and can track your fabrics to deliver them to the customer in-time. · If the fabrics need to be finished in the in the finished factory, you can also manage the finished job from sending the fabrics to finish until receiving them from the finishing factory. · WIP reports and pending finished job reports are provided in the system. · Barcode system allows you control each roll of fabrics. You can scan the fabric barcode for doing the finished goods transaction from receiving the fabrics in warehouse until generating packing list for sending the fabrics to the customer. · The fabric receive note can be generated by the system when receiving the fabrics to the warehouse and updating the stock balance real-time. · Barcode system enables you scan the fabric barcode for generating the packing list and update stock more accurately and real-time. 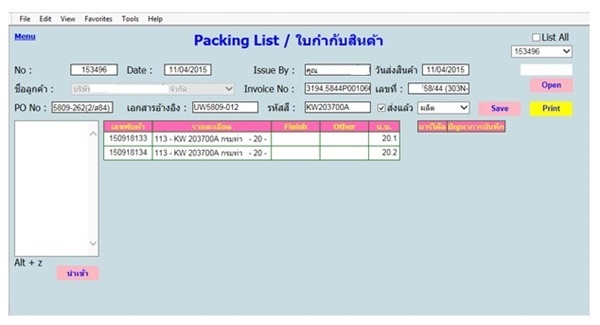 · Packing list can be printed out very easily by the system for sending to the customer. 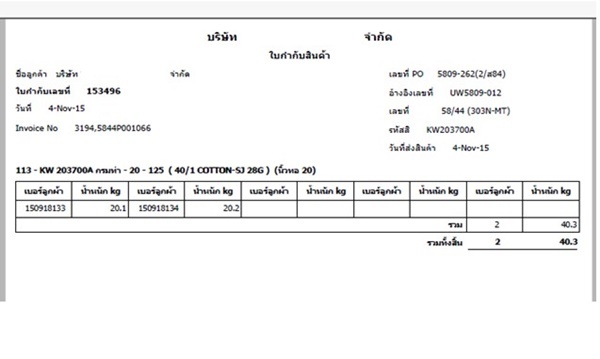 · “Overview Production Status Report”, “Production Output by Period Report”, “Receiving Dyed Fabric Report by Period”, “Packing List Summary Report by Period”, etc.